I’ve been looking into new educational opportunities lately and although I’ve already earned my USSF ‘B’ License I decided to take the new ‘F’ license course that is offered online by the US Soccer Federation. The course is a two-hour online course designed to share fun, activity-centered and age-appropriate exercises and training sessions for five to eight year olds. Coaching players of this age is very different than working with any other age group. The course shares some great methods to engage these young players and help them develop and understanding and love for practicing and playing the game. If you work with players that are U10 or younger I would encourage you to take this course even if you’ve already achieved higher credentials. You can learn more about the USSF ‘F’ License by clicking the link. 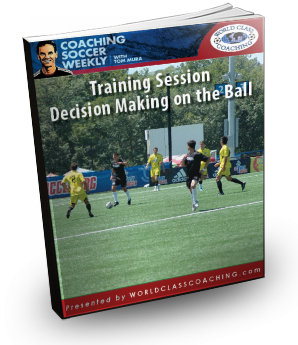 This session was inspired by one that I found on www.TheCoachingManual.com. I’m always looking for new and interesting ways to approach topics and I really enjoy how this site presents its sessions. This session focuses creating an environment that will help to train your players when to dribble and when to pass. The area is 20 x 30 yards and can be used for the entire session with very quick modifications. To begin with the players each dribble a ball around the area and discover the different techniques required to navigate each portion. The players need to dribble the ball more closely when in a crowded space and can get the ball out of their feet and move faster when their is more open space. 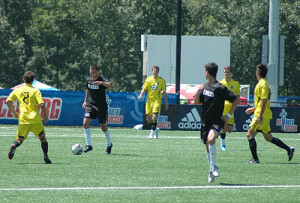 The players are in pairs with one dribbling the ball inside the area and one moving around the outside. 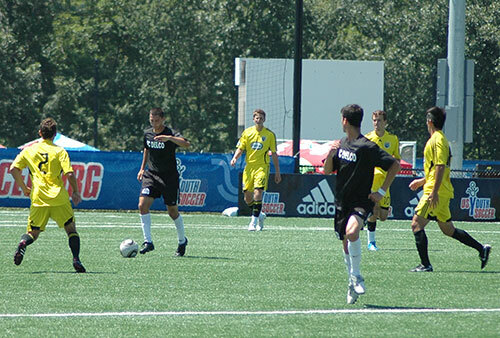 The player dribbling the ball performs one, two or three moves and then passes to their teammate on the outside. The outside player should move around the perimeter. When the outside player receives the ball he takes his first touch into the largest space available. One pair is designated as defenders. They try to win the ball from dribblers and intercept passes. If they do then they dribble the ball and stop it on the sideline before going to pressure another player. Each set of defenders work for 30 seconds to a minute before their change roles with another pair. The players must now decide where to dribble and which moves to use in order to avoid the defenders and keep possession until they can pass to their teammate on the outside. The team is divided in two with half of the players putting on pennies and going to one end of the area and the remaining players on the opposite side from them. The team that is defending passes to the other team who tries to dribble, pass and combine to reach the other side of the area and stop the ball near the line. If the defending team wins the ball they can counterattack and try to stop the ball on the other side of the area. Moving to the expanded game you should look for the players to make good choices about where and when to dribble or pass. I didn’t notice a complete transfer from the 2 v 2 to the 4 v 4 game. The players became a lot more direct than they were before. This caused them to force passes and over dribble more than they had before. The next time I use this session I will use an endzone game rather than the four-goal format shown here. My hope is that the players will focus more on possessing the ball and making good choices than on just trying to score. We would appreciate it if you would leave us a 5 star rating and a written review on iTunes to help spread the word about the show and the information that we are sharing here. I have an interview with Jonny Carter about how to prepare for and successfully complete your next coaching course. It was a really interesting discussion that I think you’ll enjoy.